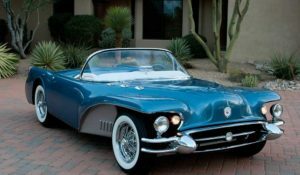 Like some of you, I knew Alex Tremulis, the primary designer of the Tucker. I considered him one of my best friends. 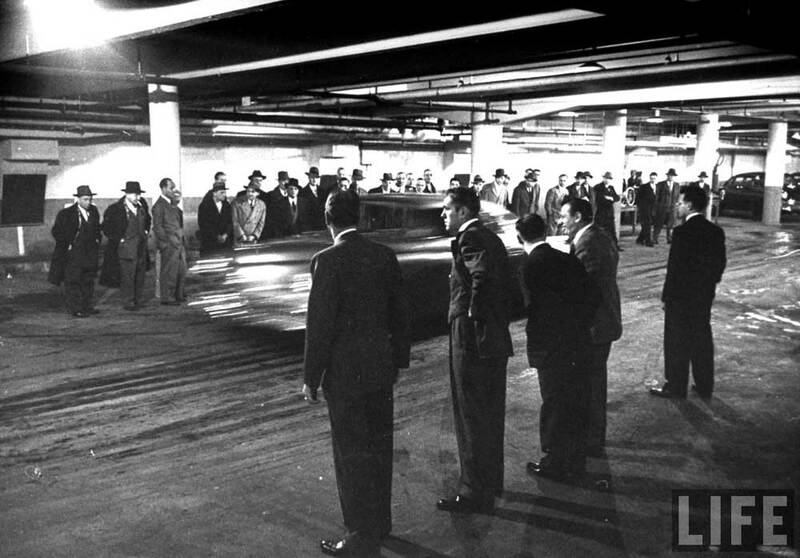 In my years with Ford, Raymond Loewy, and Chrysler I met a lot of fine automotive people (along with some of the other kind!). If it came down to choosing an absolute favorite, on reflection over the years, it would be Alex. 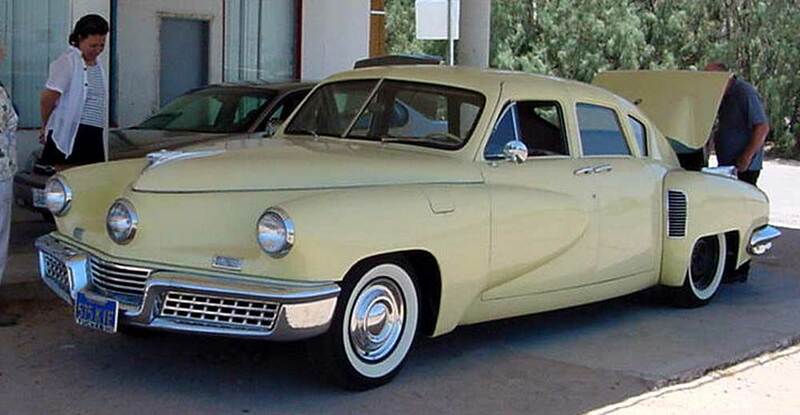 Karl, are you aware of the existing book on the Tucker, The Indomitable Tin Goose, The True Store of Preston Tucker and His Car, by Charles T. Pearson. I checked recently and they are surprisingly available at bn.com (Barnes & Noble, used and out of print books) and inexpensive. I’ve often thought that Alex’s story alone would be a good book. 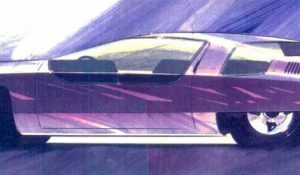 Sadly, many of those who knew him best are gone, but there are still others around; like Bill Dayton and Syd Mead. Alex autographed a copy of the Tucker book as a present to me. I first met and worked for Alex in Ford’s Advance Styling studio. 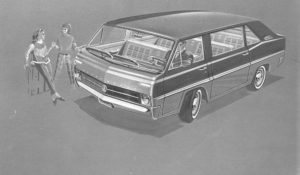 (Google “Bob Marcks” and check out “Designer at Studebaker, Ford and Chrysler” to see the neat Ford Advance studio where I started, plus a peak at Gary Smith’s laudable Dean’s Garage site. Thanks again Gary.) One of Alex’s many virtues was his genuine interest in the young designers, and his generous praise of them. As an example, he wrote in my book: “My dear Bob, Just a small gesture thanking you for the wonderful contributions you have made in the Advance Styling Dept. Don’t ever lose your intense enthusiasm. Your dedication to the principles of good design have been inspiring to all of us.” He laid it on pretty thick! Among his talents, Alex was noted for his ability to play tunes on his airbrush. Another lesser known fact: His last name, Tremulis, came from the fact that his family, in Greece, long ago, had a characteristic problem—they physically trembled. Knowing that Alex had designed a 240 MPH motorcycle, I hired him for a PR project: I wanted to promote a client’s FWD Olds Toronado-powered production motorhome, by setting a world speed record for motorhomes. 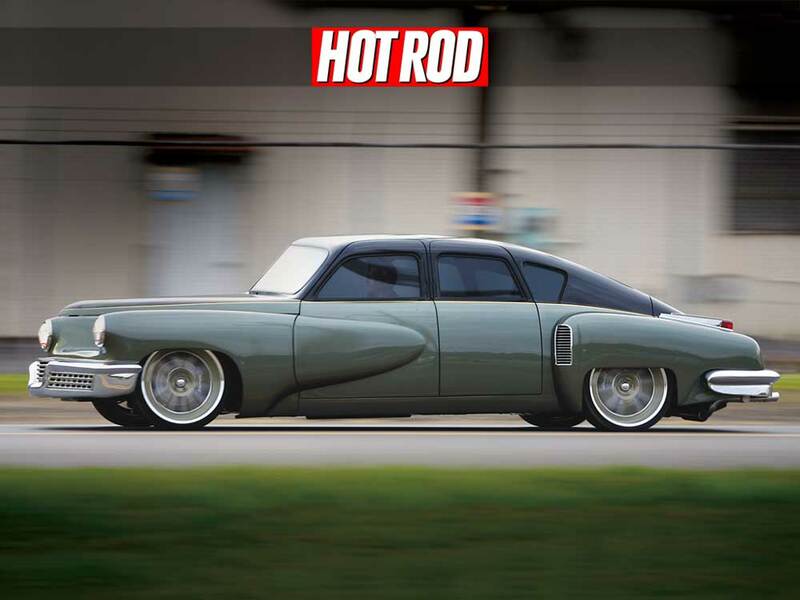 Alex set the whole thing up on a California dry lake bed, with the Southern California Hot Rod Timing Association, and drove the stock Travoy, reaching a top speed of 97.613 MPH. He wanted to change the gearing and give it the benefit of his aerodynamic flaps / spoiler expertise; he figured it could do 120+, but was overruled by the client. 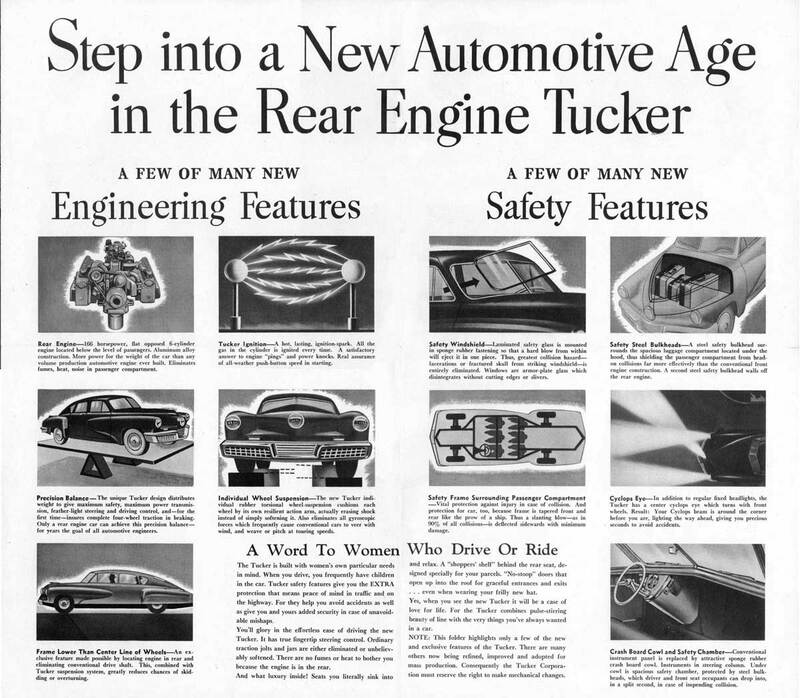 Today’s New York Times has an interesting story titled “The Tucker That Time Forgot.” It’s about a Tucker convertible “prototype.” Such stories can usually be dismissed, but if you read this one in it’s entirety, it’s pretty persuasive. I thought you might like a little Tucker input that I have experienced. 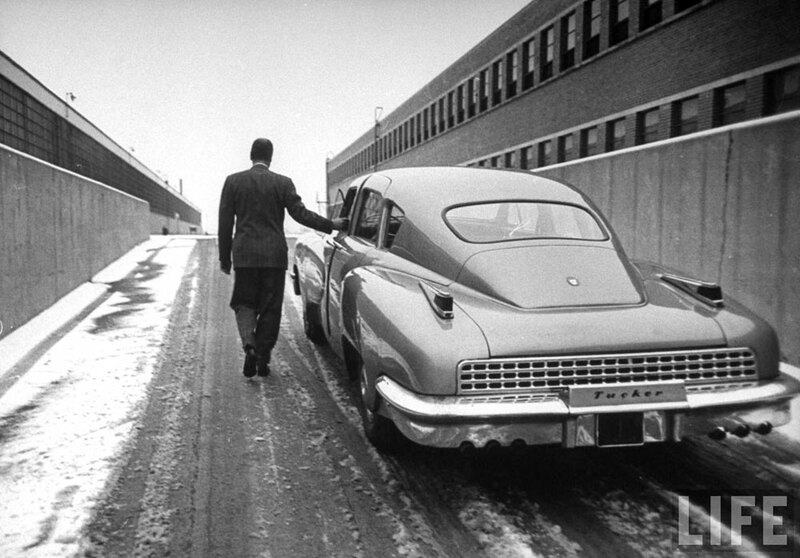 When my father was the chief designer at Studebaker in 1948, I know that he didn’t regard Detroit as having conspired to put Tucker out of business, but regarded the Tucker as a fraud. However, he did appreciate the design. 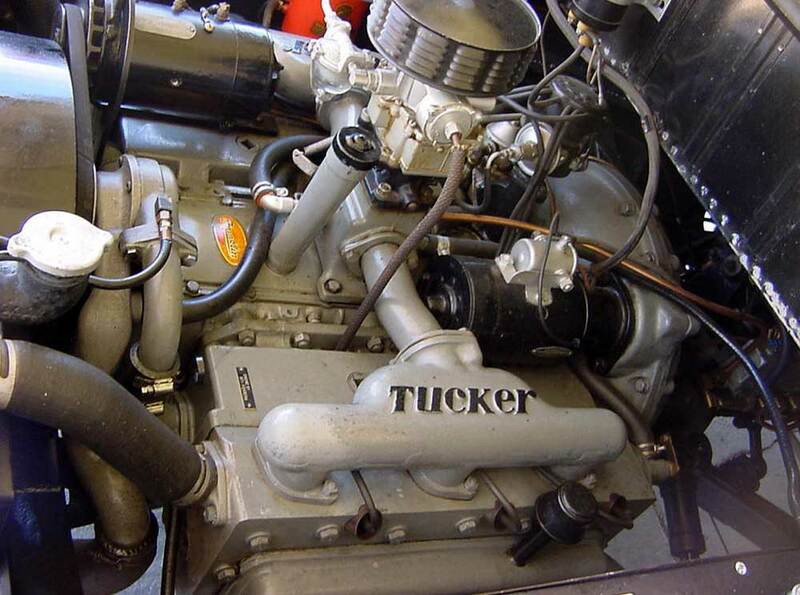 I’ve seen many Tuckers since, including the one that RM auctioned off at Monterey, CA last year for a little over a million dollars. Late that summer of ’48, on a Sunday, a guy pulled up in front of our house in South Bend and virtually pushed his way in and absolutely demanded that my father hire him. I witnessed that. Father rather sternly dismissed him and I asked father who he was. “That was Alex Tremulus, a real crackpot, blue sky type designer, that I would never hire” was my father’s disgusted retort. The next day father told Gorden Buerhig, Bob Bourke, and other designers about it and they all laughed. 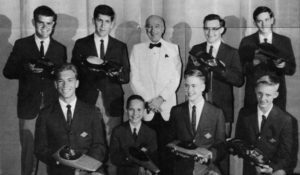 In 1961, after having come home to Birmingham, MI from the U.S.A.F and joined my father in business, I met an old guy that kept an engineering office in Detroit and was the Dayton Wire Wheel representative for Detroit. I ordered a set of chrome wire wheels for my black Valiant. In the front reception room was a beautiful smallish horizontally opposed 2 cycle, 2 cycle engine mounted on a high stand. Ben Parsons proceeded to tell me that it was his design for a drone target airplane engine during WW II. It used a perfect aluminum cube for it’s crank case. 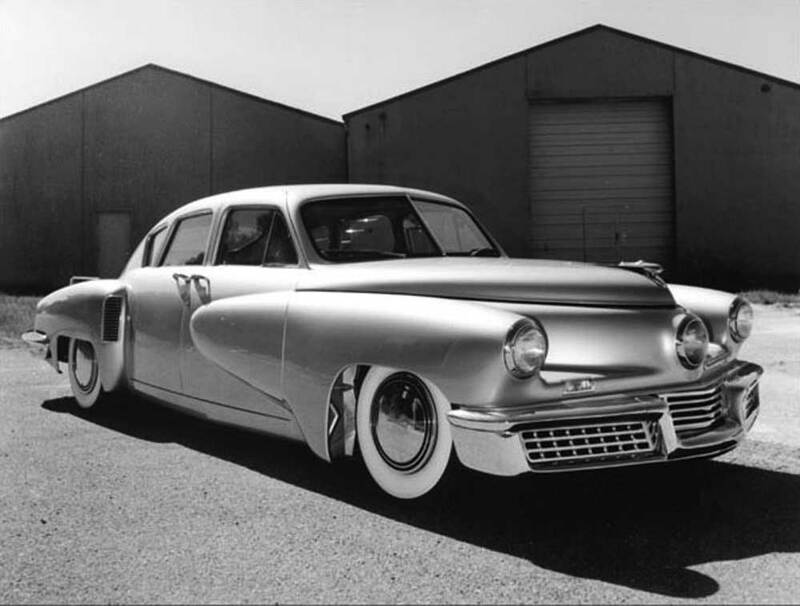 The finned nitro alloy steel cylinders were perfecly round with air intake scoops attached and opening toward the propeller. There was a glow plug atop the cylinders with a fuel injector nozzle. A timed fuel injector pump sat atop the cube in the center, and a large cylindrical tube oil cooler was beneath the center cube. 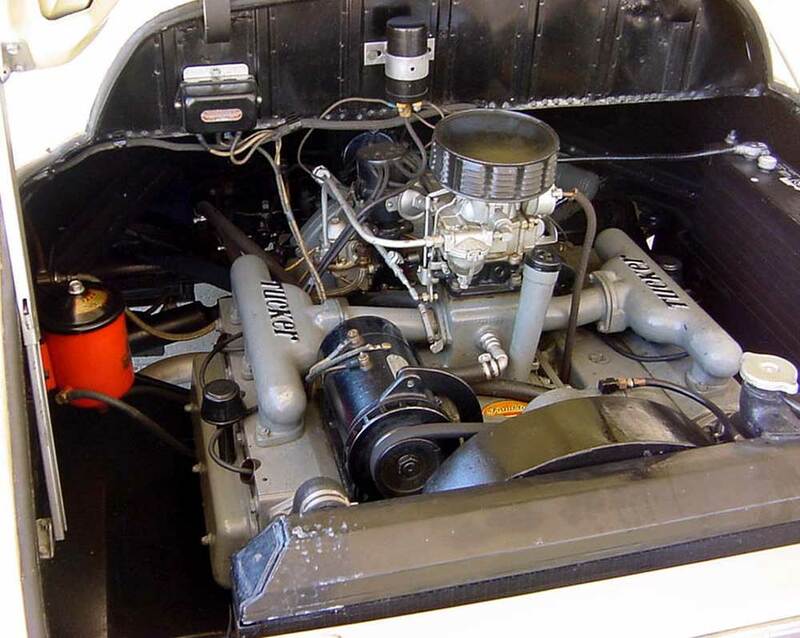 The engine had a bore of 5″, stroke of 2.5″, and put out 100 HP at 10,000 RPM. It weighed 70 Lbs. The rods were two-piece and each piece was shaped such that they would fit inside each other as attached to the wrist pin and crankshaft. 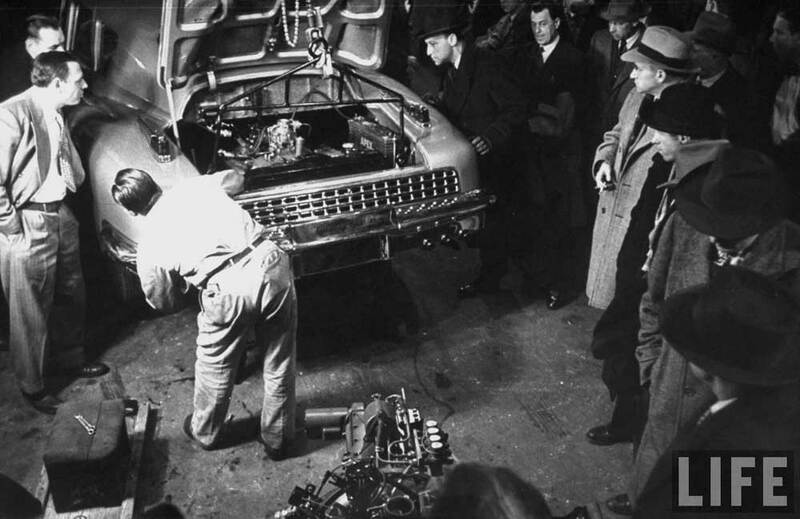 The pistons were dished for a truly hemi chamber and directly opposed. One could not put the engine together wrong in the field. 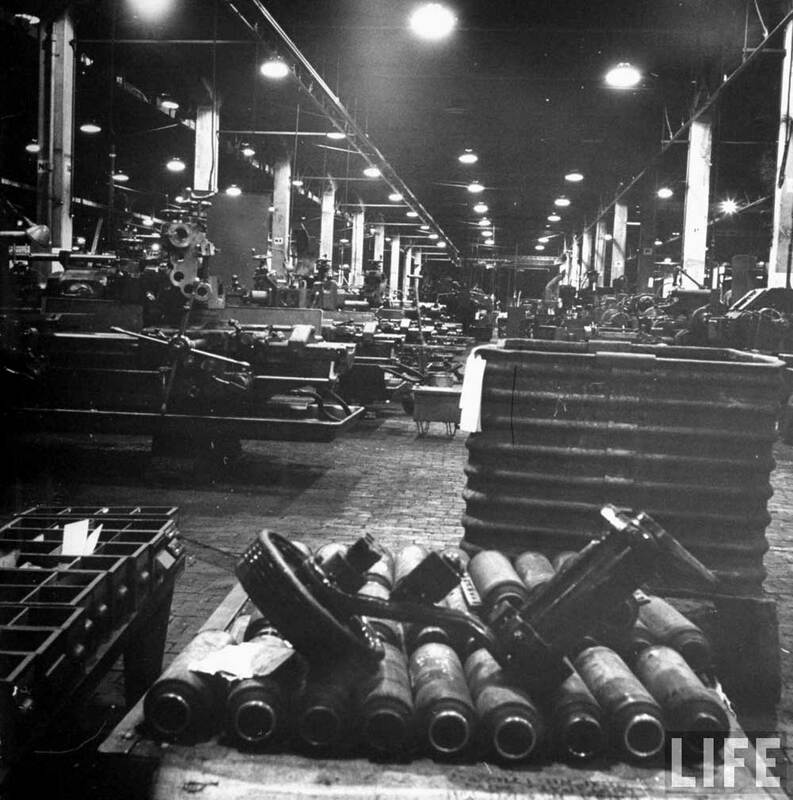 There were several hundred made shortly before the war’s end. 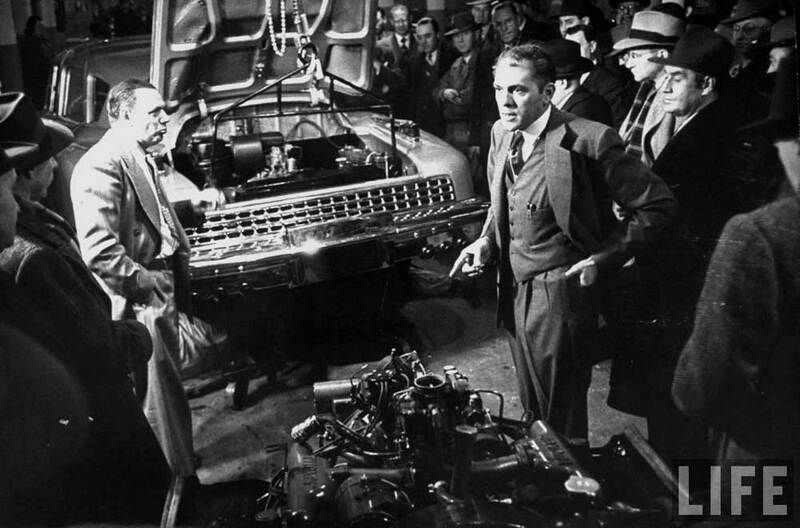 Ben was a very kindly and wonderful gentleman and told me all about having been the main designer of Tucker’s first engine, working with “Alex the Terrible,” and Bill Flajole on the Tucker. He said Flajole had more input to the body design than Tremulus. 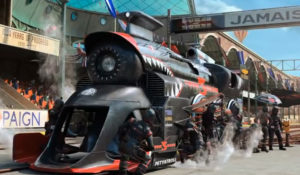 Earlier Ben had worked for Robert McCulloch on Paxton superchargers. I told my ‘sports car’ designer and engineering friends about Ben and the two-cycle engine and we visited him several times. We came away dreaming of our four-cycle version for an ultra lightweight Indy car (600 lbs) that would surely win! Then Indy went to the 1500 Lb. 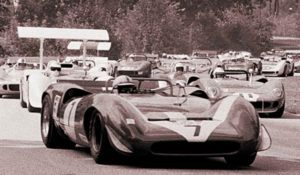 minimum weight rule, but I still dream of that engine today. I don’t know what ever happened to Ben. He was about 70 years old at the time. 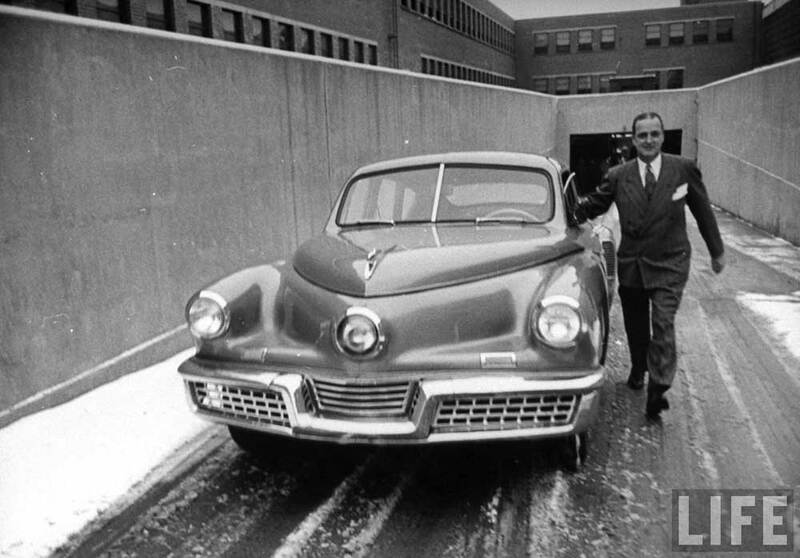 With all our blogs going back and forth on Alex Tremulis since that e-mail on the 1948 Tucker started circulating and then with a followup with the New York Times article on a ‘Tucker convertible being revived,’ I thought I’d run this one by you guys: A biography of Alex Tremulis. Alex’s bio will bear out your date of meeting Alex on the your first day at Ford Design in 1964 and that day being Alex’s last days at Ford Design. Then this biography verifies that Alex would have worked with Ron Will at Subaru of America from 1978 to 1987. I joined working with Ron Will on a contract basis in 1988. I just barely missed working with Alex but saw him a few times thereafter. The last time I saw Alex was when he was honored at Art Center about 1990. He had already suffered a stroke and could barely speak. He died in 1991 and his widow died just a year or two ago. 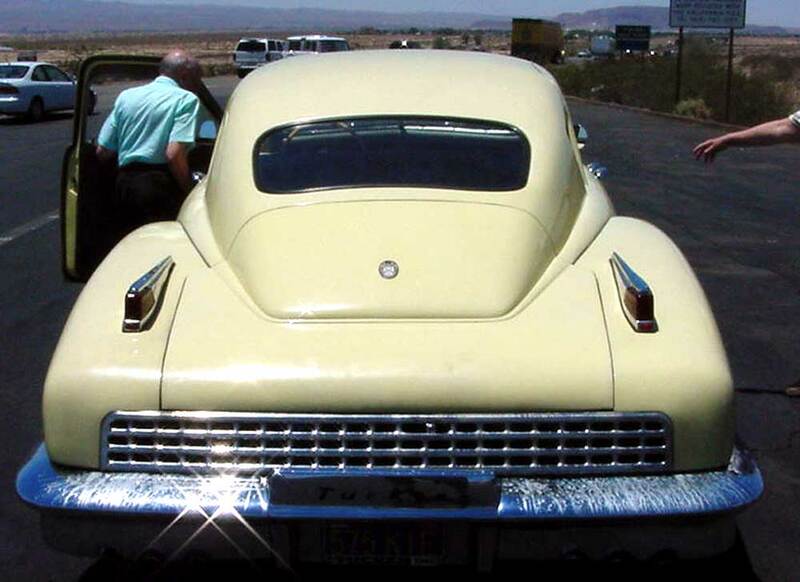 I hope all this renewal of memories of Alex coming from the this Tucker E-mail going around will prompt Karl Ludvigsen to get started on his book on the Tucker car for which he has researched so far. These few designers left, who had the chance to know and work with Alex, could well lend to enhance the charisma of this great design icon in Karl’s book. 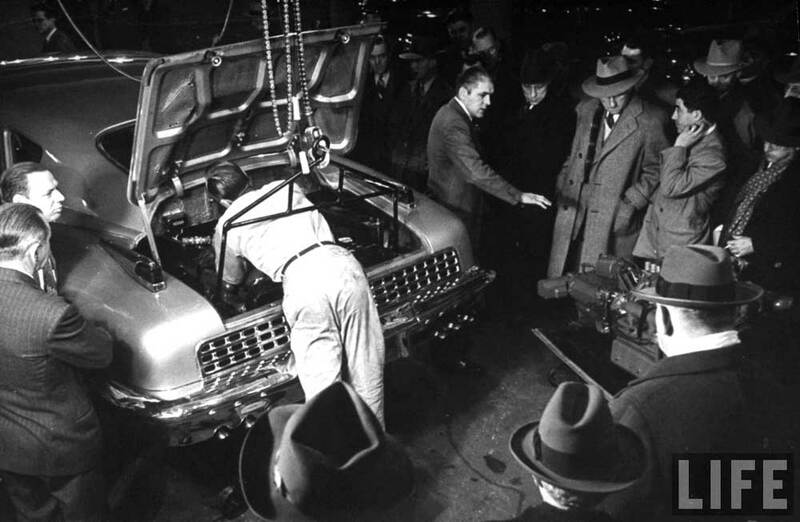 While Alex was working for Ford in the 1960s, he persuaded Elwood Engle to start a project for a gyroscopically stabilized car. It was called Gyron. A 3/8 scale, operating model was built, that balanced the car on its front and rear wheel. (I wish I could post images here). Syd Mead was there at the time, and might have more info on this. Syd did some exciting renderings of the car to try to sell management on building a full size experimental model, but they would not go along. 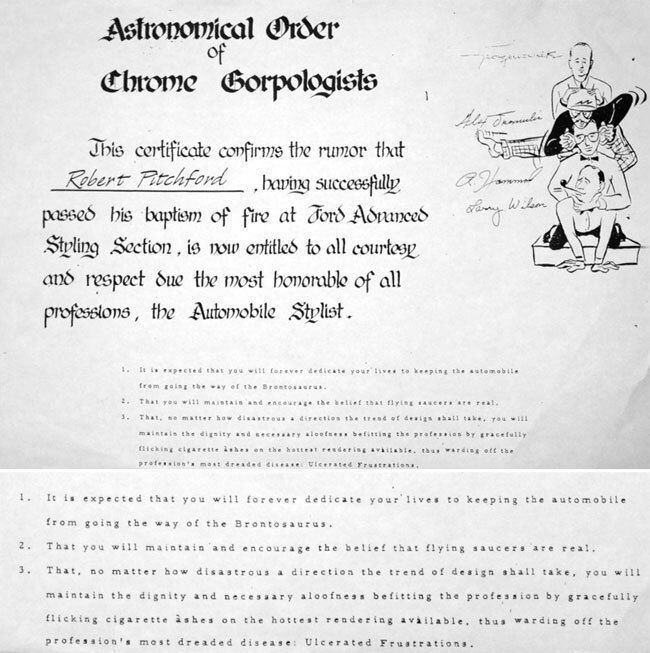 Although Alex did not have training in Aero Engineering and aerodynamics, he had aquired a pretty good feel for it, and tried to interest the company in aerodynamics at a time when economy was not a salable feature. During the early 1950’s, Alex came up with a 3/8 scale racer for the Mexican Road Races, called, appropriately, “Mexico.” I have company photos of that model. “Mexico” was tested in a wind tunnel, and found to have a very low drag coefficient, and did not lift at high speeds. Not only did Alex have the gift of blarney, but he also loved to drop tidbits of disinformation among the gullible. For example: Another lesser known fact: His last name, Tremulis, came from the fact that his family, in Greece, long ago, had a characteristic problem—they physically trembled. Heheh. Funny, but not true. Wow, what a great selection of Tucker photos! The factory ones are amazing. I’ll hope to get high-res versions of these for the book. This is all very motivating! Thanks for keeping me in the loop! 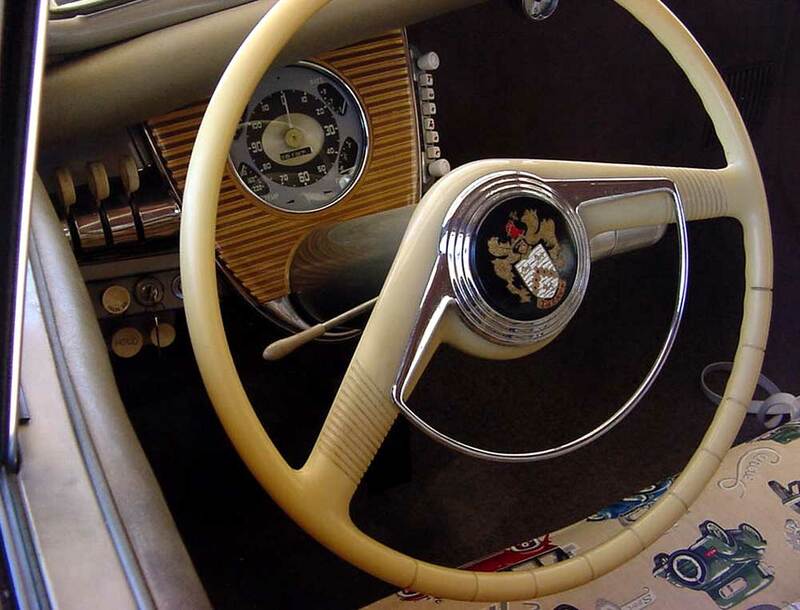 The Tucker had Lincoln steering wheels and horn ring, but with Tuckers medallion button. That much I know because I owned a ’48 Continental. 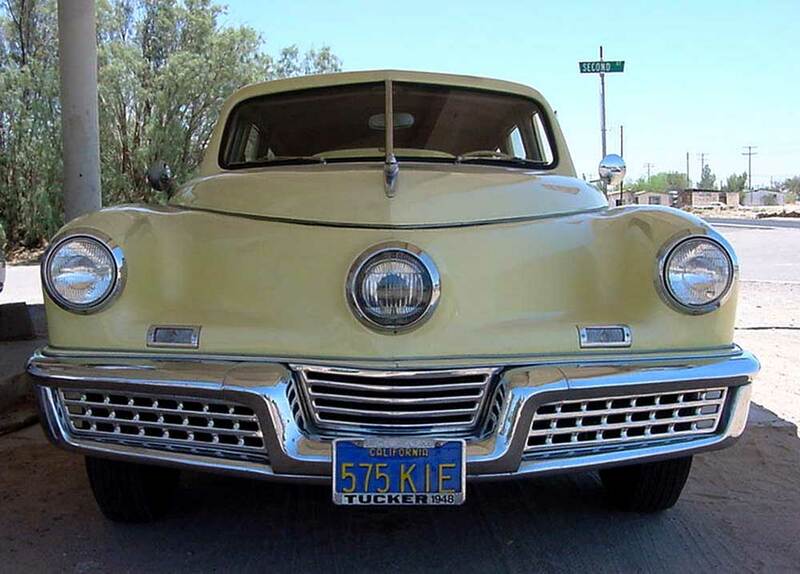 I read that Alex had a Ford contact and they had 50 Lincoln steering wheels in inventory, but with slight defects that they were willing to give Tucker. 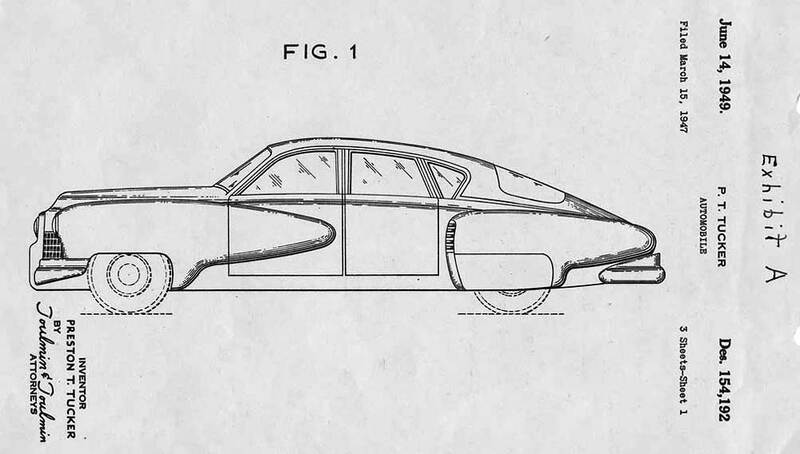 That would be a 1942-1948 design. 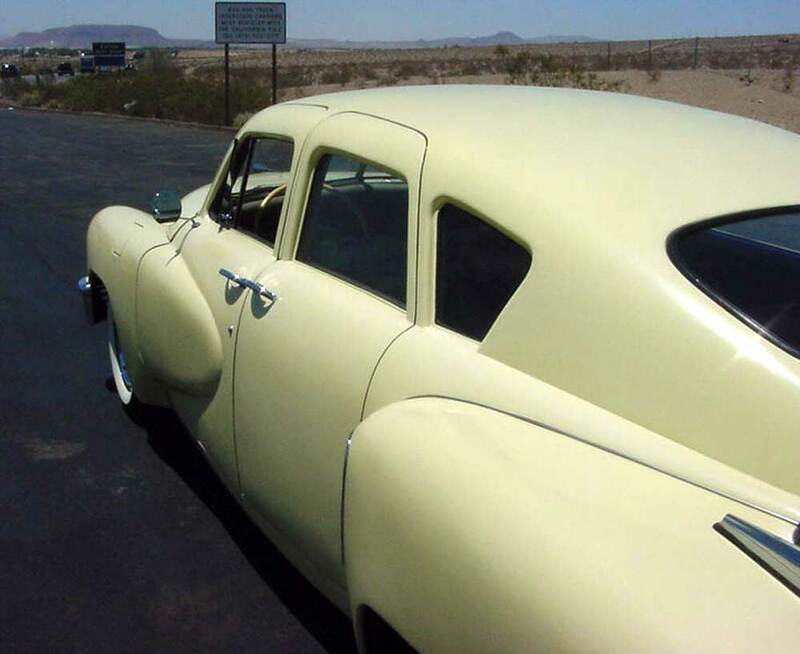 My 1948 Continental had a different, and better undoubtedly, material composition, because it was a translucent dark red. In the photo, the color appears to vary slightly which may, or may not, be relevant. 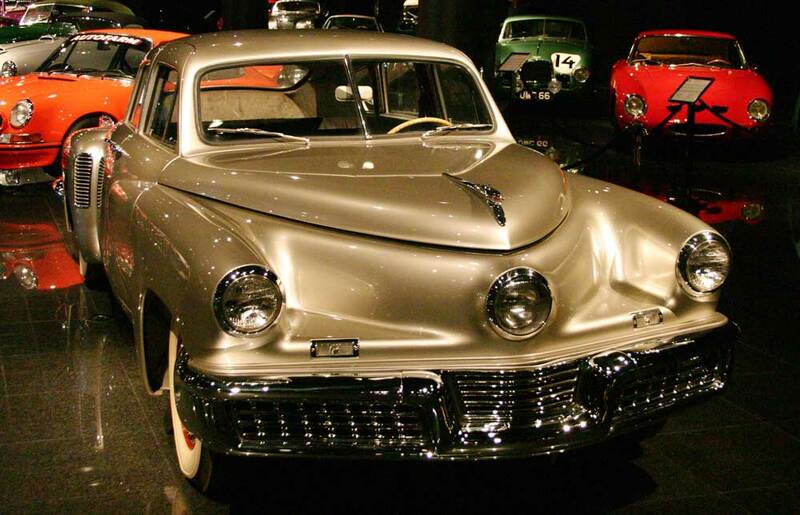 But, I also owned a 1940 Lincoln-Zephyr in 1952. 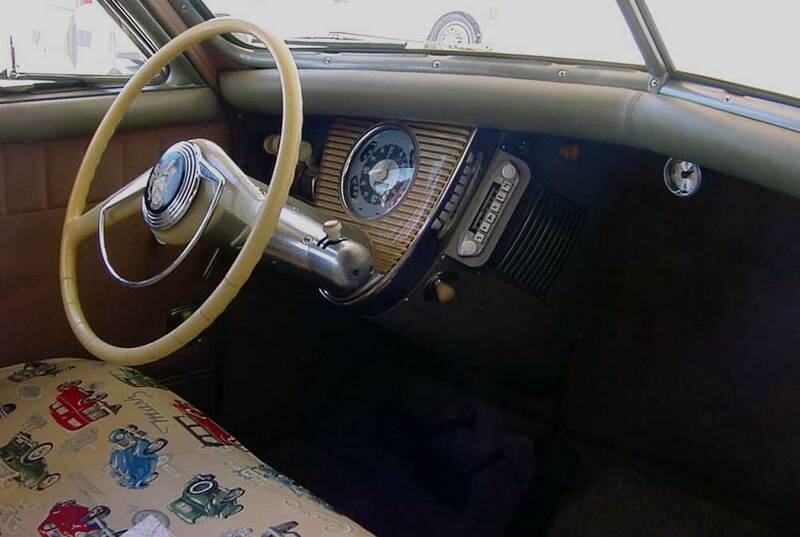 As we know Henry tried to make everything out of soy beans, so by 1952 that steering wheel, which may have been infected with soy beans, looked like shrunken dog bone segments impaled on a steel armature and may well have been the same color and similar composition as this one shown, when new. Tremulis was always ahead of everything in the styling realm. He took the Tucker corporation from 0 to 60 in no time flat. 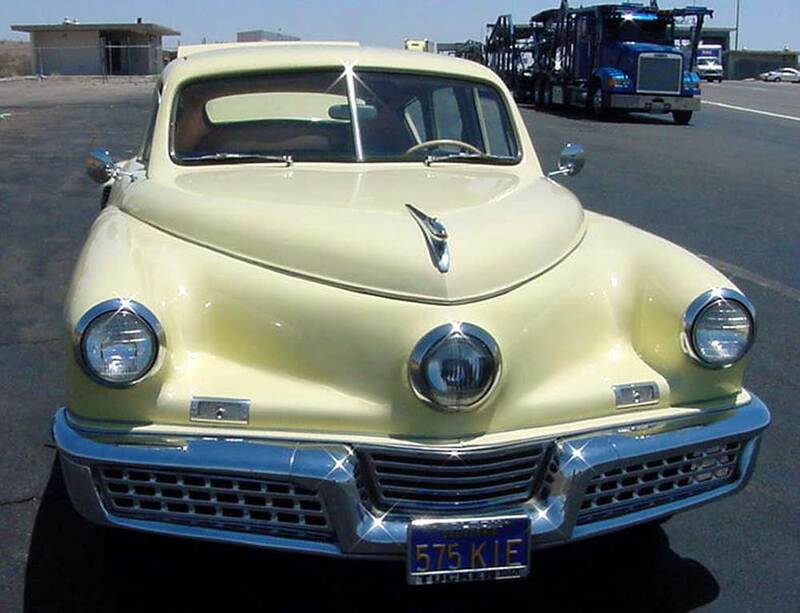 He was already starting to take the Tucker design further, when he pull #1057 out of the assembly line to become the face of the 1949 prototype with new designs in mind. Like a wrap around rear window and differently designed front fenders. I can only imagine what it would have looked liked. It became the convertible and that looks great too. But I can’t help to imagine, what if? 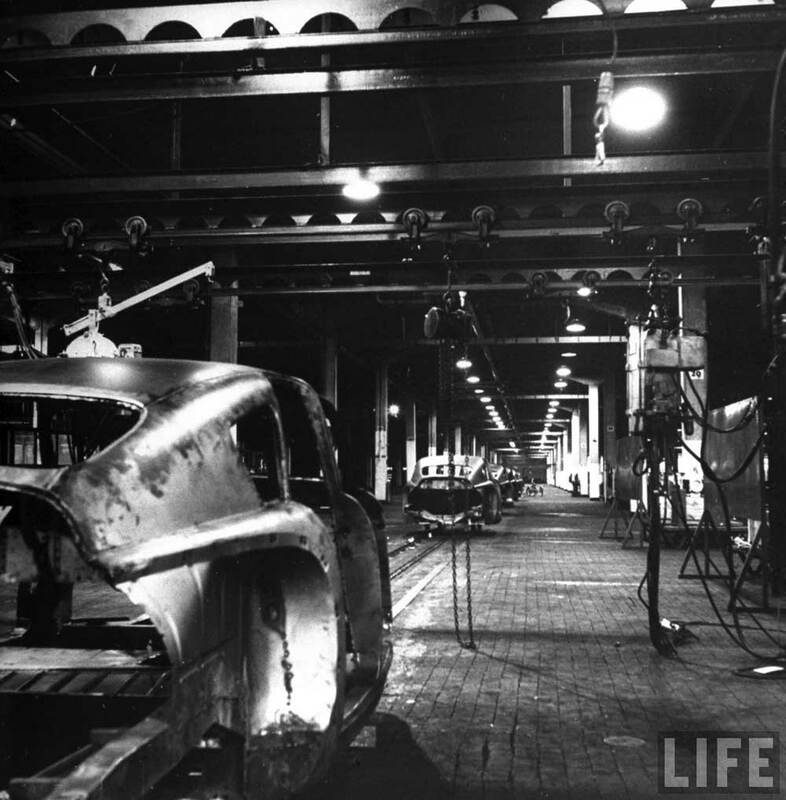 I started at Ford Design in Alex’s advanced studio in 1954. 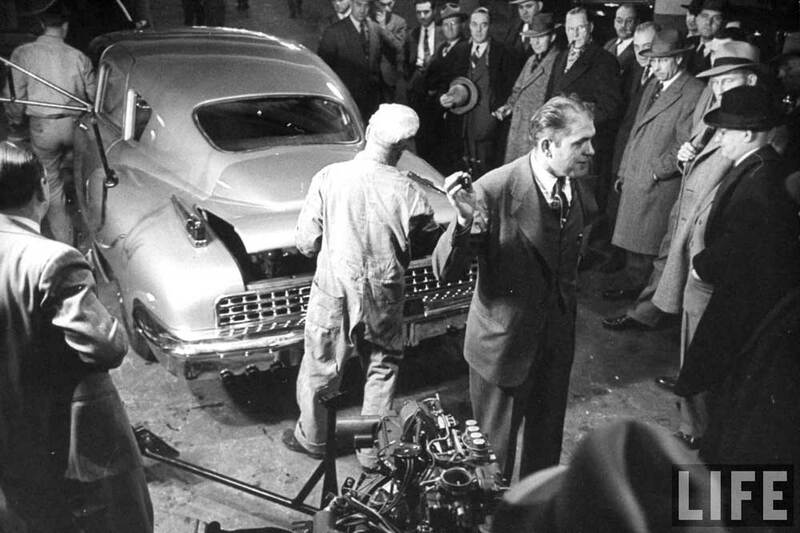 He was telling all of us new designers that he designed the Tucker automoble. I told him that my instructor at the Dayton Art Institute showed pictures of the Tucker in clay being designed. 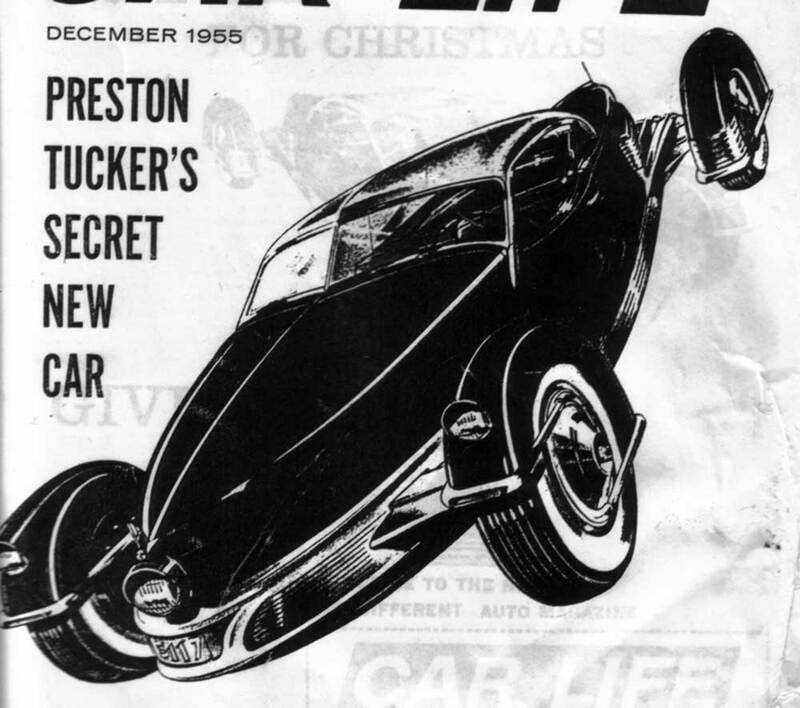 The designer’s name was Read Viemeister…his associate on the design was Budd Steinheilber…at the time they worked for Lipincott & Margolis Industrial Design firm in NY when Tucker called for design help….Alex wasn’t able to satisfly Tucker. Alex and Sid Mead were working for me in the Advanced Studio when the Gyron was designed. Together they were a great design team and worked well together….too bad Sid wasn’t at Tucker. I hope Karl Ludvigsen gets the facts correct when he writes the Tucker book.